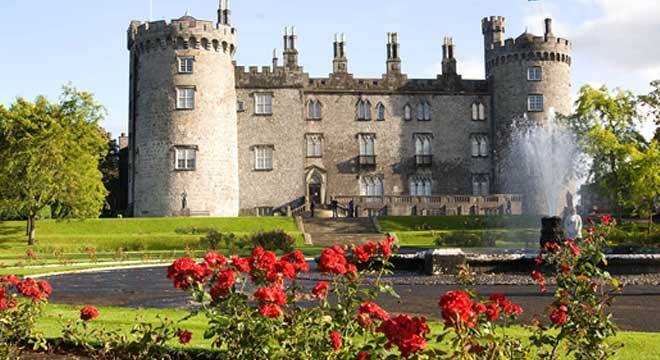 For this 9 night knitting and craft tour, the focus of your itinerary will be historic Kilkenny, the Burren area in County Clare including the Cliffs of Moher and the Aran Islands and scenic Killarney in county Kerry. Your exploits will include a panoramic tour of Dublin where you will pay a visit to Epic Ireland, one of Dublin’s newest museums. The next day we travel Kilkenny and meet Anita Marnell and Helena Kelly Maye for an intensive knitting, spinning and felting workshop. Your touring in Kilkenny does not end there however as we will also visit Zwartables Ireland Sheep Farm and Cushendale Woollen Mill. Continuing to Killarney you will visit two historic Castles on route, the impressive Cahir Castle and the famous Blarney Castle & Woollen Mills store. In Kerry we undertake another knitting workshop, this time with experienced designer and teacher, Ann Spillane. Ann will teach you how to make your own fancy/textured yarns and a variety of techniques to build texture and colour. Before you leave Kerry, we will explore the Lakes of Killarney, Molls Gap and the magnificent Dingle Peninsula, visiting Kerry Woollen Mills along the way. For the final leg of your tour travel to Doolin where we pay a visit to the famous Cliffs of Moher, visit Ekotree Knitwear and take a day trip to the Aran Islands for a knitting workshop with Una McDonagh. Today we make our way to Killarney with a few stops along the way, the first one being Cahir Castle in county Tipperary. Cahir Castle, one of the largest castles in Ireland, is sited on an island in the river Suir. It was built from 1142 by Conor O'Brien, Prince of Thomond. After a tour of the castle board your coach and travel to Cork and the village of Blarney. Cormac MacCarthy, a great Irish chieftain constructed Blarney Castle nearly 600 years ago and since then this remarkable fortress and its ‘stone of eloquence’ has been attracting thousands of curious visitors every year. Legend has it that if you kiss the stone you will never be lost for words and have, as the Irish say, ‘the gift of the gab’. Built in 1823, Blarney Woollen Mills was originally known as Mahoney’s Mills and provided valuable employment to the people of Blarney and nearby areas. Today Blarney Woollen Mills is Ireland’s largest Irish Gift & Craft Store. Continue to Killarney and check into your hotel where dinner will be waiting for you. Overnight in Killarney, Dinner, Bed & Breakfast included.